Beautiful chairs. Not good if you have animals they collect hair. Gorgeous chairs though. I got the plum color. If you are on the lookout for a classic recliner to complete your living decor, then look no further. This classic recliner will give you the feeling of when you were young, bringing back memories of sitting in your father's chair. 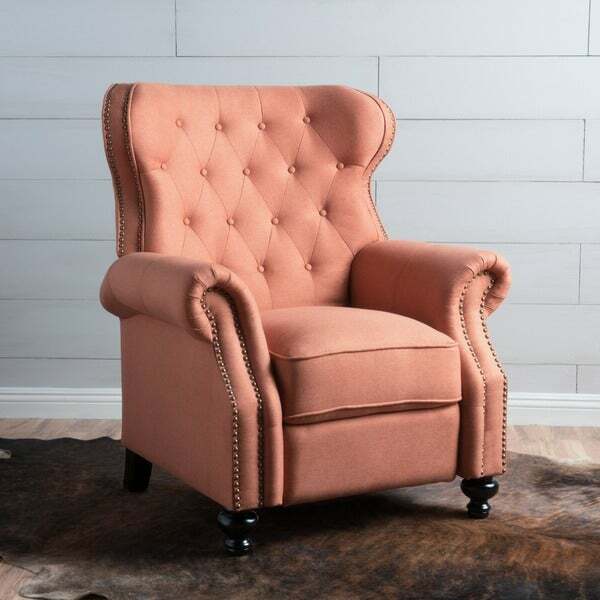 With its sleek, slightly winged back look, this recliner is sure to fit with any decor, and is perfect for those looking to class up their living room. So glad I bought two of these high-back reclining chairs for our living room. Beautiful color and very comfortable. Bought this in wheat. Looks beautiful in the living room and comfortable. Reclining function works well. Was pretty easy to assemble. This chair was a great deal. Made well and fits into any decor. The construction, fabric and design of this chair is very good, especially for the money. However, as others have said, it is VERY difficult to recline! My husband, 6 ft tall and rather strong, can recline it when sitting in the chair. I, however, cannot. If I want the chair reclined, I need to do it before sitting, and then squirm into the chair. If a recline lever had been put on the side of the chair, it would have made it much easier to recline for those of us who are not tall and strong. I LOVE, LOVE, LOVE these recliners. Everything the description said about the chairs and more. They are such a classic chair, look very elegant. I would hardily recommend these chairs to everyone. Beautiful style. This was my first furniture purchase from Overstock. I had been looking at Overstock for a chair for nearly a year. I decided to take the plunge. I was very disappointed for several reasons. 1) It was to be delivered 12/19 or 12/20. On 12/17 I saw a Budget rental truck pulling out of my triple wide driveway. I walked out on my porch as he drove past my house. The chair had been left on the other side of my car in the middle of my driveway. I was shocked. No one came to my door nor did I get a notice it was being delivered that day. 2)The listing pic shows a light grey color even though the color is listed as charcoal. I went with the chair because of the picture. I wanted them to match the grey drapes I recently ordered from Overstock(which were great looking). It is a medium blue denim looking color which had no grey or charcoal in it. The back in the upright position is not upright when the footrests are not up. It leans back so I feel like I'm in a slight reclining position. I could not push the footrests in order to recline with them up. My 6' strong son could not push it back either. The only 2 strong points were that it looked good style wise, and I liked the firm higher seat for getting up due to my back issues. I can not recommend this chair unless someone is not concerned about color or functionality. I had read the customer reviews first. Since opinions varied, I had to go with my choice to go for it. Customer service associates were great in assisting me in returning the chair. We love the look, comfort, and height. Christopher knight collection will be our future purchases. Delivery time was great. It is a comfortable chair. The color is as shown in the picture. The recline works fine. Sitting pillow is firm. Note that you need to push this chair to the reclining position before you sit down. Or at least I have not figured out/ or I am not strong enough to push it back while sitting. Overall, good chair at a good price. 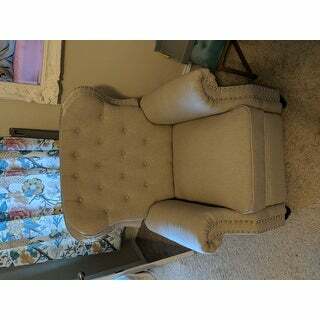 This chair is perfect and it is very comfortable and very well made. It has a lovely cloth texture that is hard to decipher in the pictures no matter what color you choose we chose the cream/wheat it had two names in the search for the color however the color we received is something between a taupe/gray/cream color lol it will blend very naturally with those colors very well. The material is a mix between a linen cotton poly blend very durable, The cushion is nice and thick and the tufting is deep and lovely. The reclining mechanics of the chair is very tight but I’m sure, or should I say it is my hope that it will work itself in and the mobility will get easier when reclining the chair. Other then that it is a beautiful addition to our living room. I was so excited to get these chairs due to the reviews. Got them and am so disappointed, not comfortable at all, seat is rock hard, it's not easy to recline and the charcoal color is very blue. I purchased this for my husband. He is 6.2 and about 260lb. It's a bit small, but overall the right size for our space. He likes that it's on the firmer side and good on his back. I would recommend it! Like the chair very much. Hated how it was delivered. I was home all day. When I went to check my mail, the carton was in my driveway. No knock on the door or doorbell ring, no notification at all. Wonderful value - great quality! We ordered the Orange. It is a beautiful color....more of a light pumpkin. The material has a very nice woven texture look. Easy to put together! Very comfortable to sit in and easy to recline! Love it!!! Purchased in beige.. love them! They fit our space perfectly and are so comfortable. People ask me all the time where I got them from. I ordered two of these recliners. They came very well packaged and in perfect condition. The color is just as shown, a soft coral orange. I have purchased many, many household items from Overstock, and I have always been completely satisfied. With their low prices, I can afford to add new pieces often. I love the color and the style of this recliner. The only down side to this chair is it not as sturdy as I had hoped. It seems a little .. only word I can think of wobbly, The back slides on and it just doesn't click down firmly. 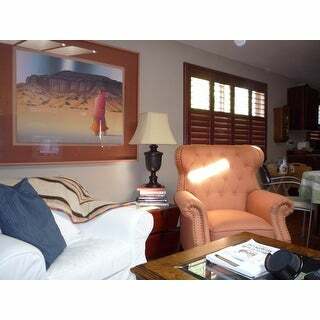 I decided to keep the chair and use it in my coffee/wine room because I truly love the color..a burnt orange. It is really pretty but didn't want it in my living room due to the worry of it being broken if someone plopped down in it. For a lightly used room I think it fits nicely. The color and fabric is beautiful, it was easy to put together. Seems very comfortable, recliner opens all the way so you are actually lying flat. Chair is beautiful, but not that comfortable. I am still happy I got it. It is a nice chair. Love the color!! Style and color of the chair. It’s not real comfortable to sit in for long periods of time. The chair is extra firm but looks beautiful in my living room. Terribly uncomfortable. Also, I ordered grey and they were nearly denim blue. Overstock was wonderful processing the return, though. Beautiful chairs, they are just as described. Very comfortable to sit and recline in and look very elegant in our room. We ordered two and have had no issues with either. Would definitely recommend. "Do the feet come attached or do they have to be assembled? " They do not come assembled and you just need to insert them in. "What is the total length fully reclined?" When fully reclined, the length is 36 inches. "How do you recline? A review mentioned that you must recline before sitting. Is there more than one recline position?" My husband can recline the chair while sitting, but I am not strong enough. I wish they had put a lever on the side, or somehow made it easier to recline. Not a great design. There is only 1 recline position. "How hard is it to Assembly I'm handicap"
I too and disabled. I can walk only on my heels and therefore balance and strength are issues for me. I was able to assemble this entirely by myself by sitting on the floor to connect the feet to the base. once the base was upright on it's feet, I then, from a kneeling position was able to insert the back piece into the guide brackets. The most difficult part was getting the pieces out of the very deep box. I ended up slicing a door in the side and pulling things out sideways. I hope this helps. "How high is the seat off the floor? I have long legs and like a higher seat." The seat is 19 1/2" off the floor. If you have long legs are you also a lot taller than an average height man? If you're taller, this /might/ not be the chair for you. It's smaller in size. It's sturdy, but I think it was deliberately sized to fit in smaller rooms. I am 5'5" tall and it's /perfect/ for me. I could imagine that it would remain comfy up to about 5'11. If you're over 6' tall, I think you start to run into things not fitting you quite right. But this is conjecture based upon me at my height. I think the seat is higher than regular chairs, but only slighly. "How wide is the actual seat cushion from side to side?" The actual seat cushion width is 18 1/2".